It has been but seven days since throngs of people attended those special worship services, hearing songs and sermons, commemorating that most important event﻿—the crucifixion and resurrection of our Lord and Savior, Jesus Christ. In reviewing and pondering that miracle, my thoughts have been drawn to the episode after the Jews had bound Jesus and led Him to the judgment hall. “Then Pilate entered into the judgment hall … and called Jesus, and said to him, Art thou the King of the Jews? “Jesus answered him, Sayest thou this thing of thyself, or did others tell it thee of me? “Pilate answered, Am I a Jew? Thine own nation and the chief priests have delivered thee unto me: what hast thou done? “Pilate therefore said unto him, Art thou a king then? Jesus answered, Thou sayest that I am a king. To this end was I born, and for this cause came I into the world, that I should bear witness unto the truth. Every one that is of the truth heareth my voice. Further negotiations, however, between Pilate and the accusers of Jesus brought about the crucifixion. With the question “What is truth?” Pilate left Jesus standing alone, without granting Him the courtesy of reply. One wonders why. Such action leads one to believe that Pilate feared the truth, perhaps as others might fear it﻿—not being willing to face up to it, not wishing to take upon themselves the discipline and responsibility demanded by truth. Jesus said, “Every one that is of the truth heareth my voice.” Those who are “of the truth” are those who sincerely seek after it. All of mankind should be seekers after truth for it is the supreme essence of their lives. Truth is knowledge! “This is life eternal, that they might know thee the only true God, and Jesus Christ, whom thou hast sent.” (John 17:3.) Truth defined is found in the gospel of Jesus Christ. During the Savior’s ministry on earth, He organized His church, choosing humble but sincere men to be His apostles; He lived with them; He made journeys with them; He taught them; He performed miracles before them; He ordained them, granting authority and power﻿—all preparatory to sending them into the world to declare His gospel. On a certain occasion as He journeyed with them, “Jesus came into the coasts of Caesarea Philippi, [and] he asked his disciples, saying, Whom do men say that I the Son of man am? The rock of revelation is the foundation of His church. The principle of revelation is indispensable in the living church. This principle is inherent in the affairs of God as He directs His children through His prophets. The Church of Jesus Christ of Latter-day Saints was restored under the power and authority of divine revelation. Early in the nineteenth century a sincere young man whose name was Joseph Smith, a seeker after truth, found in the Epistle of James (which was written to the “twelve tribes which are scattered abroad” [James 1:1]) these powerful words: “If any of you lack wisdom, let him ask of God, that giveth to all men liberally, and upbraideth not; and it shall be given him. “But let him ask in faith, nothing wavering. For he that wavereth is like a wave of the sea driven with the wind and tossed. Further instruction came to him at that time that he would be God’s instrument in restoring His true church upon the earth. Jesus was the Creator of this world and all things pertaining to it. He was Jehovah who revealed His will to the prophets, thus ushering in all of the gospel dispensations that have occurred. The Bible, however, does not contain all the revelation that has ever been given. Through modern revelation the Book of Mormon was brought forth through the Prophet Joseph Smith. It stands as a new witness of Jesus Christ and discloses that His gospel was known to the ancient inhabitants of the Americas and that He visited the Americas after His ascension. These inhabitants were known to Him as “other sheep of my fold” (see John 10:16; 3 Ne. 15:21) for they carried in their veins the blood of Israel. Through modern revelation we now know that Adam received the gospel. It has been revealed that “Adam and Eve, his wife, called upon the name of the Lord, and they heard the voice of the Lord … speaking unto them, and they saw him not; for they were shut out of his presence. We now know more concerning Enoch. The Bible gives but little information about this great prophet. 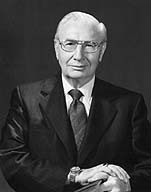 Latter-day revelation tells of his work among his people. Says Enoch, “The Lord which spake with me, the same is the God of heaven, and he is my God, and your God.” (Moses 6:43.) He explained to Enoch the whole plan of salvation, the gospel of Jesus Christ as it had been declared to father Adam. We now know more of Noah, that the “Lord ordained Noah after his own order, and commanded him that he should go forth and declare his Gospel unto the children of men, even as it was given unto Enoch. Now we know more of Abraham, as Jehovah spoke to him and said: “My name is Jehovah, and I know the end from the beginning; therefore my hand shall be over thee. The gospel reveals to us the need for Jesus to offer Himself as a sacrifice for the sins of men that all mankind may be redeemed, that man may be saved by believing in Him, by believing in all of His teachings, and by being obedient to them, and by being true hearers of the voice of Jesus. It is a lifelong task to hear, to learn, to obey all the vast truths, for the gospel reaches into the eternities. May that be done in the attitude of prayer. I bear witness to the truth, that revelation and prayer are indispensable in attaining eternal life, and this I do in the name of Jesus Christ. Amen.